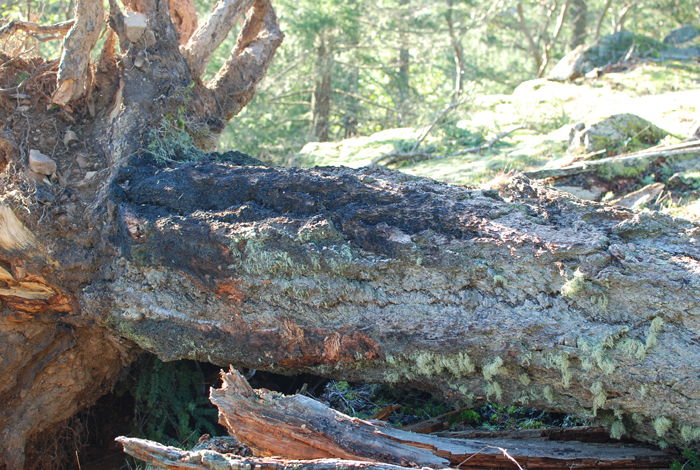 Old-growth tree with knobbly bark and a fire scar that was uprooted in the Dec. 20 windstorm. Tara Martin from UBC is seeking examples of such trees for research purposes. A University of British Columbia researcher is using windfall from the Dec. 20 windstorm to further her research into the history of wildfires on Salt Spring Island. While old-growth trees can be a wealth of information about the history of climate change and wildfires for a given area, taking samples usually ends up killing the tree. However, the recent windstorm has provided researchers with an opportunity to obtain samples and valuable insights from the fallen trees. First Nations peoples traditionally used fire to promote food and other resources. The oldest trees on the island will often have scars or remnants of those fires. However, the last 150 years have seen fewer fires and any fires have been actively suppressed. “When we combine fire suppression with post-logging regrowth — most of our forests are second-growth forests with the exception of these few big old giants — we get structurally a very different looking forest,” she said. Martin said that Garry oak meadow ecosystems were more prevalent on the island before fire suppression. These ecosystems have been replaced by stands of Douglas-fir growth, particularly in deeper soil areas. Martin is asking for anyone who might have a tree that fits the criteria to contact her. The trees need to be older than 250 years old, which can be difficult to determine. She is looking for samples of the tree rings cut at a height of about 1.5 metres. For her research, she also needs information about where the tree grew. Those who have a potential tree on their property are asked to contact Martin at tara.martin@ubc.ca. Martin can also help identify trees that might be usable.